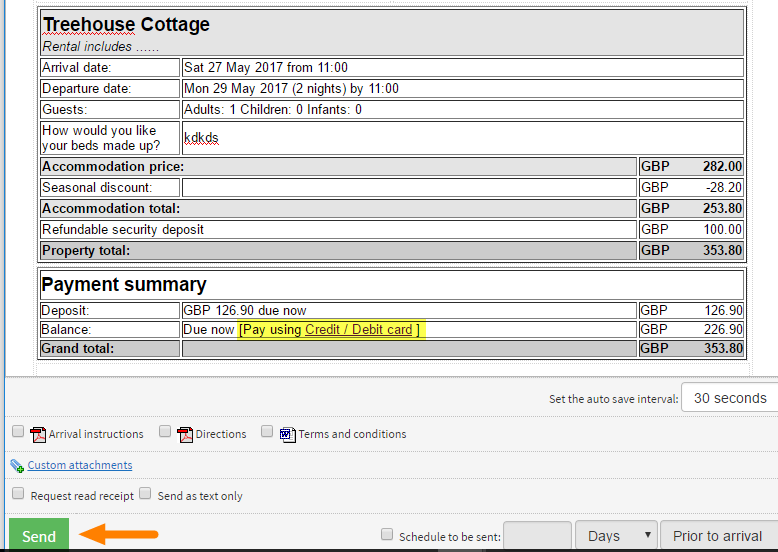 Help CentreUsing SuperControl Managing bookingsHow do I send a guest the online payment link for their booking? 2. Click on History & Correspondence. If sending an email template then select your letter and include the customer summary. 3. Click Generate. You can now see the payment link included as part of the customer summary. 4. Click Send to send this to your guest. Once a guest receives this email they can click the link and enter their card details online to process their payment. This saves you time so you don’t have to contact the guest by telephone and it saves the guest time as they can quickly pay a balance online. Prev: How do I send an email within a booking? Next: How can I take a payment in a booking? If you schedule a reminder to be sent, does the date generated show as the date the letter was generated or the date it was sent? If you schedule a letter to be sent it will show as the date it was sent within the History & Correspondence tab in the booking screen.